The initial menu of gNewSense 4.0 consists of several options, including Live and Live failsafe modes. I went for Live option and in a few minutes landed on the default screen. The boot process itself was rather quick. 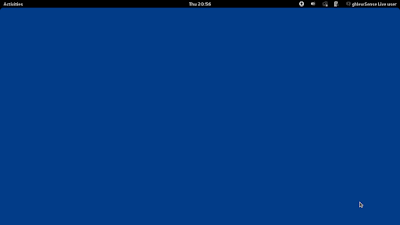 GNOME is the only available desktop environment in the Live version of gNewSense. 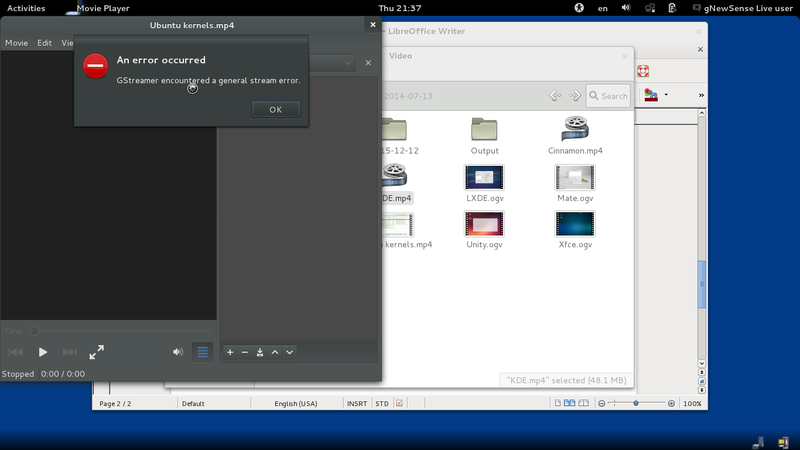 It means that after the boot I ended up on the default screen that is typical for GNOME desktop environment. 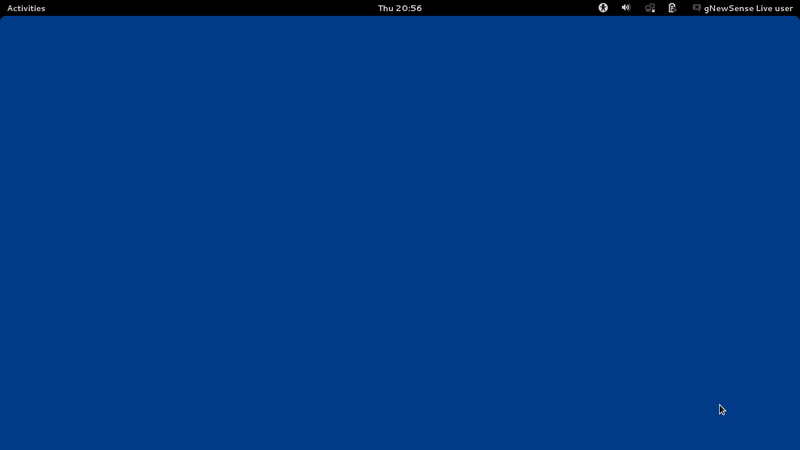 The screen is a clean blue wallpaper without any decorations on it. There is a choice of about 15 alternative images for the wallpaper if you prefer. There is a panel at the top of the screen with "Activities" button on the left. You actually don't even need to press the button, but just roll the mouse over it to get the desired result. There are clocks in the centre of the panel and a notification area on the right. This area includes volume and network control icons, battery indicator and a user menu with several options like System Settings or Switch Off. When Activities are activated (sorry for tautology), two panels appear on the sides. The left panel contains the quick launch buttons that you can customize. The right panel shows active virtual desktops and allows you to open a new one. gNewSense 4.0 took about 280 Mb of memory to boot, which is quite decent. For example, it is less than Xubuntu 16.04 that uses a less resource-hungry Xfce desktop environment. [ 13.418306] rtl8192se:rtl92s_init_sw_vars():<0-0> Failed to request firmware! [ 13.418309] rtlwifi:rtl_pci_probe():<0-0> Can't init_sw_vars. Translating into English, there is no free driver for the wireless card in gNewSense 4.0. It means no wireless network for me. I had to write this review off-line, which is a bit unusual. Even though I could not test the network drive connectivity, I was able to try the local drive mounting. My local HDD contains an NTFS partition where I keep some data. 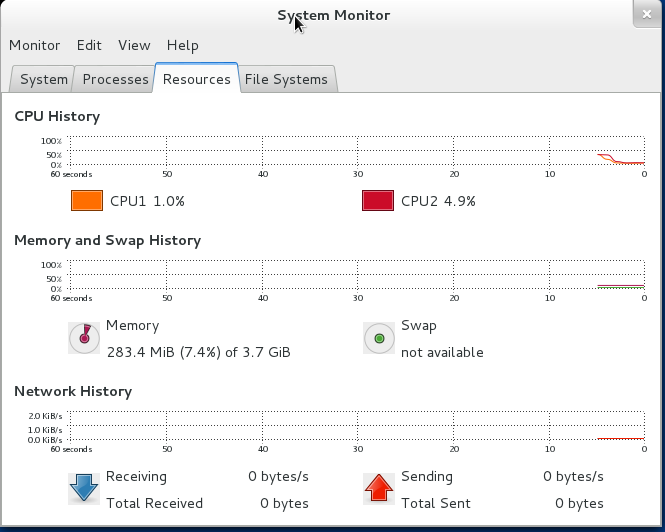 I was able to use that partition straight from the Nautilus File Manager. 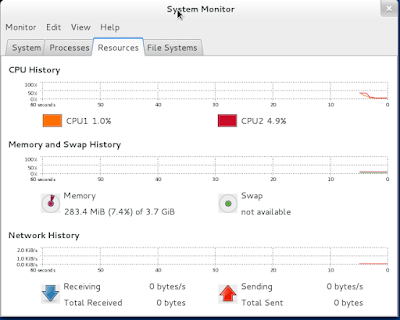 gNewSense includes the NTFS utilities, probably the free open source ones (cough, cough!). The only thing I would like to mention here is that notification appeared at the bottom of the screen after the mounting of the new partition. It did not disappear until I clicked it, which is a bit annoying. English US is the default keyboard layout in gNewSense 4.0 GNOME. There is a guide for my readers where I explained how you can configure alternative layouts in GNOME 3 if you need them. It is easy. Once you have more than one layout, an indicator appears in the notification area with a symbol for your current layout. Some GNOME 3 based operating systems I tried lacked an option to use Ctrl-Shift as a switch between the layouts. gNewSense 4.0 does not have this problem. gNewSense 4.0 GNOME comes with quite a good set of immediately available applications. Iceweasel 31.5.0 is the default browser. That version was released in February 2015. Even though it remains supported as an Extended Support Release version, there was a newer ESR version 38 available at the moment when gNewSense 4.0 had been released. There are also Empathy, Transmission, Remote Desktop and some more tools in the Internet section of the Applications menu. There are several games in the default distribution ranging in complexity from Mines to Chess. Productivity tools are represented by LibreOffice 3. Yes, you read it right. A few months after the LibreOffice 5 release, we still have brand new distributions that sport the 3rd version of the office package, 3.5.4.2 to be precise. Graphical tools of gNewSense 4.0 GNOME include GIMP, LibreOffice Draw and Inkscape editors, scanning utility, Shotwell and Document Viewer. SoundJuicer ripper, Brasero disk burning utility, Cheese webcam, Rythmbox player, Sound Recorder and Totem Movie Player make the Multimedia section of the menu. Of course, you can find many other small tools and utilities in the menu. Just to name a few: Synaptic, System Monitor, Calculator, Desktop search and so on. There are actually several software installation utilities in the gNewSense 4.0. In addition to the above mentioned Synaptic, you have gDebi installer and GNOME Package Manager. gNewSense has its own set of repositories and mirrors. They are located in *.archive.gnewsense.org domain zone and mostly country-specific. Unfortunately I could not check any installation facilities or repository contents of gNewSense 4.0 due to lack of network connectivity. 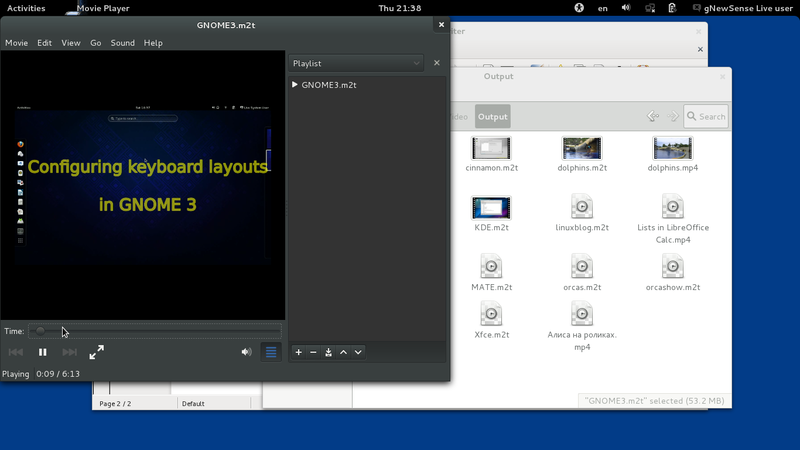 Totem Movie Player is the default multimedia player in gNewSense 4.0 GNOME. Even though you have a "free" operating system, it still includes codecs for MP3 playback. That's why I could listen to MP3 files from my local drive. I was also able to watch some videos. Unfortunately, some videos were unavailable. gNewSense is the operating system supported and to the large extend promoted by the FSF, Free Software Foundation. Its task is to show what you can achieve with free open source software only. However I felt myself a bit deceived here. I can totally understand why Realtek driver was not included in the distribution. But why do I get NTFS and MP3 utilities then? It is a bit of inconsistency in my mind. On another hand, the lack of drivers due to their non-free nature means an inconvenience for me. I have a laptop that has certain hardware. I want to make this hardware work. If the FSF's principle forbids the ability to use the hardware, I need to forbid that principle on that hardware. That's the dilemma. That's the nuisance. That's gNewSense. About MP3 it seems that a lot of patents expired in 2015, my guess is that it might possible to decode MP3 and play them using this now "open source" material... About NTFS it might be because it uses NTFS-3G which can be "licensed under either the GNU General Public License or a proprietary license" (that what says the wiki). With what he says about Ubuntu I cannot imagine Richard Stallman supporting anything that it is not 100% opensource-GPL :D Thanks for the article by the way, keep on the good job, it is nice to read you dark duck. I'm happy you have enjoyed your reading. I have subscribed to this linux blog.